EU researchers have shown how small nanotech particles suspended in a liquid separate out by size as the liquid evaporates, an effect that can lead to techniques for making layered structures that improve the performance of many everyday products, such as sun cream and electronics. 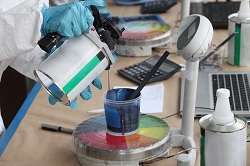 The EU-funded BARRIER PLUS project has published results from experiments where they have been able to successfully demonstrate, both theoretically and experimentally, that paint consisting of two particles of two different sizes, if they are large enough, separate out during drying. The result is that the smaller particles, that are on a nanotech scale at just one thousandth of a human hair, form a layer on top of the larger ones, an entirely new technique. By producing colloids that dry into a two-layer structure, the effect may allow for the creation of cosmetics and electronic devices with novel properties. As the liquid in a drying colloid evaporates, particles below the service are forced closer together as Brownian motion results in the particles jostling together randomly. For smaller particles, Brownian motion is faster, so they are more easily able to redistribute themselves as the colloid volume decreases. Larger particles are unable to move away so quickly and thus accumulate at the surface-air interface. Researchers who have studied colloids containing particles of different sizes have found that for certain evaporation rates, larger particles concentrated at the top of the drying film whilst smaller particles were more evenly distributed throughout. It was widely assumed that the same was true for all evaporation rates. However, BARRIER PLUS researchers based at the University of Surrey, UK, discovered the exact opposite, when they examined more closely a suspension containing two sizes of particles. The stratification they found was neither expected or predicted, and as such spent several months verifying their results, conducting both detailed computer simulations and lab experiments on water-based colloids containing spherical particles of two sizes. The team modelled suspensions containing large and small particles with various size ratios and with several different population ratios. As the water evaporated, the smaller spheres moved up, whilst the larger ones went down. The effect occurred for particle-sized ratios ranging from 2:1 to 14:1, but only when the number of small particles was higher than the number of large ones by a factor of 200 or more. They then verified the effect by using acrylic particles with diameters of 385 and 55 nanometres suspended in water, labelling the larger spheres with a red fluorescent dye. After the colloids dried, the researchers again discovered that the division of particles had again occurred, but only provided that the numerical ratio of small and large particles was above 200. Following the BARRIER PLUS experiments, this process of particle stratification could lead to the development of new and innovative products across a range of industries. One example is sun cream lotion, where sunlight-blocking particles could be designed to the top when applied, leaving the particles that stick to the skin underneath. There are also possibilities for the electronics industry, as a coating for a mobile phone could be developed with dual properties, such as scratch-resistance on top and the ability to adhere to glass at the bottom.